Distinguished members of Government were in attendance at last Thursday’s approval of Sean Collier to the Somerville Police Department during the regularly scheduled Board of Aldermen meeting. A framed shirt with Sean’s badge (#310) was presented to Sean’s family followed by a small reception in the Mayor’s office. 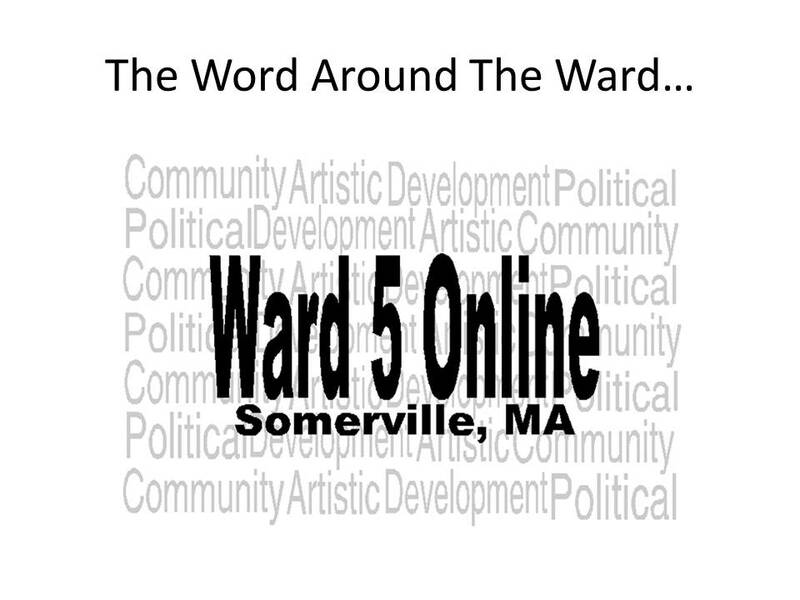 Ward 5 Online would like to wish Matt Dias the best of luck as he pursues a new opportunity in Utah. No word yet on who will take his place. Information will be posted here as soon as it becomes available. Albion Street construction is half-way completed with Hinckley still being handled by National Grid. Please be careful when navigating these areas. Baiting requests have been submitted for both streets as sightings have increased due to construction. The front door to PennyPackers was opened last weekend as they continue prepping for their grand opening. An official opening date has not been made public, but will be posted as soon as it is. Yard signs for all three School Committee candidates can now be seen in various locations around the Ward. What are your thoughts on the race? Feel free to comment below. Tonight's SomerFest movie is "Groundhog Day!" It will be shown at Seven Hills Park at sundown and is free! I would have had she not promoted Mark Niedergang at my neighbor's house when door knocking a couple of months ago. Sorry--she lost my vote then. Who is her campaign manager? Do they know she is doing this? Was it promoting or did you ask her opinion on him? You should consider each candidate on their own merit and qualifications. There are some who might write off Courtney solely because of her connection to Sean O'Donovan. Do you view that as fair? She asked me to consider him for alderman without being prompted by me. I thought it very awkward because I have never had a candidate do that before. I heard she is doing this but didn't mention Mark to me. So did she say the comment to you or your neighbor? Either way I really do urge you to speak with her again as she will be a great asset to the committee. I am a parent of 2 kids in the public schools and I was Laura on their side. "was" should have been "want". I AM a horrible typist!